Trading Spaces not only hire and sell portable offices and storage containers, we also supply high quality sales offices and marketing for property sites. Property developments often need a site office. It’s preferable if it can be added whilst needed and removed at a later date, so obviously a lot of large scale property developers use portable sales and marketing suites and executive offices, to give them maximum flexibility and to provide a comfortable smart area in which to discuss home sales with prospective buyers on site. 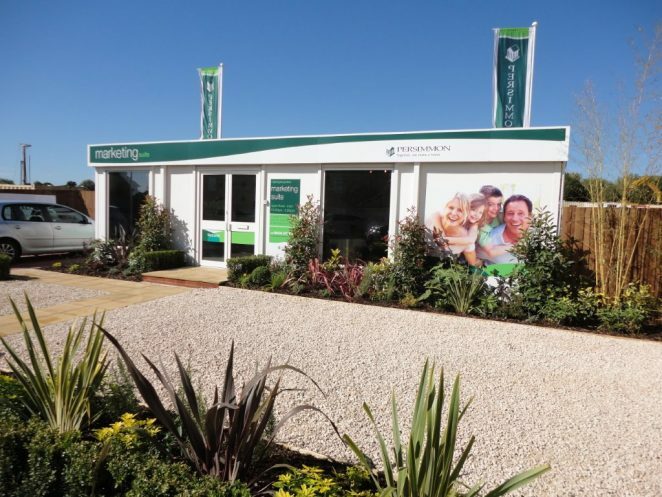 Trading Spaces have been supplying Persimmon Homes for about 12 years with sales offices, marketing suites and executive offices on their development sites. These sorts of portable offices can be purchased or hired and come with a full range of extras such as air conditioning, toilet facilities and tea-making or kitchen areas. Best of all, they have electrically operated security shutters so that they can be secured at night. If you need a smart site office for a property development or any other space, then our range of sales offices and marketing suites might be ideal. For further information on our range of executive offices and marketing suites please call for a no-obligation chat on 01206 212505.